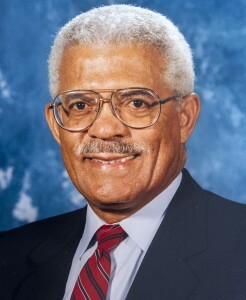 Quinton Edness was a Bermudian businessman, politician, and former Cabinet Minister. Quinton Lancelot Edness was born in 1931 to Naboth and Louise Edness. He attended the West End School and the Berkeley Institute and also spent time at Bloor Collegiate in Toronto. Edness joined the Bermuda Broadcasting Company as a trainee announcer in 1951 and nine years later became sales manager. He later became a familiar face on television and an even more familiar voice on radio and continued to rise in the company until 1984 when he stepped down as managing director of radio and TV. Edness was a United Bermuda Party (UBP) Member of Parliament for Warwick West for 30 years, serving many of them as a Cabinet Minister. Edness was elected to Parliament in 1968 after he won the Warwick West seat and went on to serve in the UBP Cabinet in a variety of roles. He held the portfolios as Minister of Works and Housing; Minister of Health and Social Services; Minister of Marine and Air Services; Minister of Community Affairs; Minister of Works, Housing, Agriculture and Fisheries. Edness steered several major Acts through Parliament, including the Misuse of Drugs Act 1972, the Bermuda Housing Act 1980, the Human Rights Act 1981, the Public Works Act, 1984, the Waste and Litter Act 1987 and the Housing Assistance Programme 1988. He was also Bermuda’s representative at the Caribbean Health Ministers Conference and in 1979 he flew to New Zealand for a meeting of the Commonwealth Parliamentary Association. He was also a well-known businessman and, after retiring from as an MP, a political commentator. He was also a former director of the Bank of Bermuda; a former director of Canadian Pacific (Bermuda); and a former independent director from LOM. Edness also served as director and chairman of the board for Richmond Corporate Services. In 1992 in the Queen’s New Year Honour’s List, Edness was awarded the Commander of the Most Excellent Order of the British Empire (CBE) for public services in Bermuda. Edness was married to wife Vicki, and was the father of daughter Stacey. Edness died on 11 January 2018, aged 86.